How can you launch an announcing career? Every sports fan has favorite announcers and favorite calls. Al Michaels shouting, “Do you believe in miracles?” as the United States Olympic hockey team upset the Soviet Union at the 1980 Games forever captures the feeling of that day. Announcers who work with specific teams often become associated with those teams, like Baseball Hall of Famers Marty Brennaman in Cincinnati and Vin Scully with the Los Angeles Dodgers. At its highest levels, a career as a sports announcer can be rather glamorous and provide a high level of pay. But it is important to note that announcers at the top of the game typically have paid their dues to land those coveted jobs. Sports announcers typically begin preparation for their careers in college, in and out of classes. Typically this involves attaining a bachelor’s degree. Future sports announcers may prepare through a multitude of college majors, from liberal arts majors to more specific majors like communications, journalism or radio/television majors. Students who major in a liberal arts subject, usually attempt to take some of the more specific radio-television classes. Conversely, if you are majoring in communications, a well-rounded education certainly will prepare you to be a storyteller for sports fans. Announcers need many tools to tell the game story while entertaining fans. Also, speech, voice, and music classes are beneficial to develop an appealing voice. No matter your focus in the classroom, sports announcers need to gain extensive field experience. Many colleges staff radio stations and feature student announcers who call the games of the various college sports programs. Obviously, this is a valuable experience. Outside of college opportunities, students should pursue internship opportunities with media outlets to add to their experience. Announcers typically record their games and keep track of excellent calls. They can review these performances to critique themselves and improve. When they begin to pursue jobs, these recordings are sent to media outlets who use them to make hiring decisions. While occasionally an announcer may burst on the national scene at a young age, most begin working in smaller markets. Perhaps an announcer will start by working games for a minor league baseball team or small college. Even landing these jobs can be very competitive. Success in sports announcing typically involves hard work at these smaller positions to improve one’s skills. The good news is, sports announcers typically enjoy their work. It’s also important to note that most radio, television, and Internet broadcasts feature play-by-play announcers as well as color commentators. 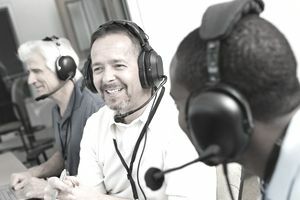 Typically play-by-play announcers describe the game as it unfolds while the color commentators are experts on the sport, usually former players or coaches. Even of the limited announcer spots available, about half are awarded to former athletes and coaches. Players or coaches interested in making the transition to announcing can benefit through some preparation during college. That said, recently retired star athletes and coaches often are hired and then begin training. Media outlets know that fans crave their insight. When first breaking into the field, sports announcers typically are paid modest amounts of money. As they progress in the field, that pay increases to rather impressive figures in the top positions. When first starting, sports announcers often will serve as a one-man band of sorts: required to perform technical duties for the station they work for or handle promotions for the team that employs them. The ever-increasing popularity of sports coverage on radio, television, and the Internet has created new opportunities for sports announcers. It’s not uncommon for a sports announcer to also host a sports-talk radio show, for instance. Increasingly media personalities are crossing over to new platforms, with writers hosting podcasts and announcers writing blog posts or columns. To best prepare for this changing reality, developing a broad base of writing and speaking skills and experiences is a key to unlocking career opportunities.